Eight school pupils from across the country took on key production roles for BBC One's Question Time on Thursday 30 June. 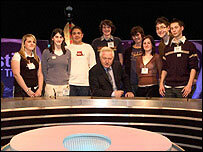 After two successful years the Schools Question Time Challenge is to run again in the coming academic year, 2005/6. "You have to be ruthless. You only need 12 questions out of 300, and they'll soon be coming in faster than you can both read them." Question Time editor Nick Pisani may have been ousted from his job for this week, but he is on hand to offer advice to teenagers Lizzie Schofield and Craig Klessa who are the student editors for this special edition of Question Time. With 90 minutes to go before the recording of the programme starts, the tension is building in the production office. Eight students have been given responsibility for key areas of the programme, but the editor's task of choosing the questions on the night is arguably the most pressured. The sense of urgency mounts as the audience producers (Rachel Jenkins and Marcus Trotter) thrust them handfuls of suggested questions with increasing frequency, written on cards by the 150-strong audience members who are gathering below in the studio. Nick reminds them: "It's a huge responsibility from now on until the end of the programme." David Dimbleby joins them to review the shortlist, and the final few questions are selected and agreed upon with seconds to spare. The students had already chosen an unusual strategy for their audience, restricting applications to the over 50s and under 25s. This, along with their choice of panel, and questions, were all unknown quantities until the end of the programme. But their desire for a dialogue between the generations pays off. Rather than antagonism between the two groups, their two perspectives complement each other, with comments on the importance of good parenting and the role of the different generations striking a chord with everyone. Veteran MP Tony Benn, sharing the panel with somewhat younger counterparts Otis Ferry and June Sarpong, implores the students to study history when addressing the dilemmas of Africa. And, perhaps befitting for a public figure in his 80s, he appears to be challenging the next generation to take up the baton of responsibility. If the students who took part in this year's School's Question Time are remotely representative of their generation, it seems it is a challenge they are likely to accept. As the last notes of the Question Time theme tune - played live on set for the first time ever - became drowned out by cheering and applause, the sense of achievement was palpable. With no prior television experience, to have produced an edition of Question Time for national television was an impressive feat in itself. But it was in fact the culmination of a year long project for them. The Schools Question Time Challenge is a nationwide initiative to support the teaching of citizenship in the classroom and is supported in partnership by the BBC, BT and the Institute for Citizenship. The crucial contribution that Question Time brings is that it is "for real", says Zandria Pauncefort, chief executive of the Institute for Citizenship. "Other classroom exercises in citizenship are just exercises. But for all 12 schools that get through to the final for this, it's on the edge: it's real life, real risk, real responsibility. "And that's the key. We've discovered we have to give young people responsibility to take decisions and engage with the wider world." It aims to complement the citizenship curriculum in schools by encouraging those who take part to learn more about communication skills, society and politics. After downloading a free citizenship teaching pack from BT, schools write a proposal for putting on a Question Time-style event. Finalists then stage their own event based on the programme. Crucially, the judging at all stages is based on criteria such as listening and communication skills, and citizenship awareness. The winners then have the opportunity to produce a real Question Time programme for BBC One. After running for two successful years, the challenge is set to become an annual event, with the 2005/6 challenge recently confirmed. Zandria Pauncefort says next year will be "bigger, deeper and better". "We will be starting earlier this year. By mid July we will have an outline of lesson plans, to help teachers more. "And all schools that enter early will be guaranteed a session with a BBC journalist. "We have had tremendous support from the BBC. The commitment from the people who work there, and from David Dimbleby, has been sensational. There is a great buzz about it. "The news media is so important in our world today and this is an amazing opportunity for pupils to see how the real world works." The project also has real virtue, she says, because it has impact across entire schools. Even though only two students from each winning school went through to produce the BBC One programme, many more students were involved throughout the year and were also present at the filming of the programme itself. From the Institute's point of view, one of the most interesting things is to see how young people grow in stature. All 12 schools which have put on events have created stronger links with their local communities. But it goes beyond just local issues, says Zandria. "The institute perceives problems in all dimensions: from global trade and aid, question marks over how Europe proceeds, to national issues such as Asbos. "As a society, we're trying to re-define the future and are in for a very exciting time. The whole agenda is up for debate. Where are we going with 21st century citizenship? "The young people are trying to define this. This is a transition point for these young people, as they become adults." The whole issue of citizenship needs to be thought about more widely, believes Zandria. "This is the sort of debate the country should have started at the new millennium, rather than concentrating on a dome and some fireworks. "But we are planning a new, all-party parliamentary commission on citizenship, a larger format which will look at some of these global to local issues. "Global, local, environmental citizenship - how do they all link together? "Citizenship enables you to ask just that - it's a prism through which we can look at our behaviour. "We want to set up a major debate. Of course we won't solve everything overnight, but we can't solve anything at all until we start asking the right questions." And asking these sorts of questions was precisely what Thursday's special programme was about. 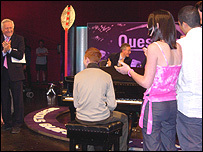 The Schools Question Time programme for 2005 was broadcast on Thursday, 30 June, at 2235 BST on BBC One.